I have tried other forums but was not successful. Because my project is embedded related, I'll explain a bit. I'm making a lazertag game and I have realized that the sensitivity of the phototransistor is very small based on the data rate I want to achieve. (Yes I even put a potentiometer as a load). With a 10K resistor, my range was maybe 3 cm max from any part of the phototransistor's rim. Increasing the resistor can increase this range but lowers the speed. The datasheet states the rise and fall times are 15uS each if load resistor is 1K, current is 1mA and voltage is 5 (I think). The part is pt334-6c. 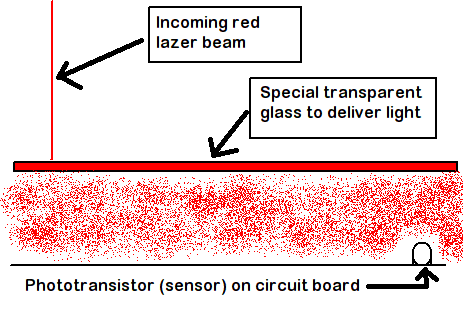 Basically, a large plexiglass plate covers the entire circuit board (note I didn't feature the other components in the picture) and when the lazer beam hits any part of the glass, the glass senses it and lights up the entire circuit board so that the phototransistor detects it as valid light. The sparkly red is light from the glass. What exactly do they call this material? I mean I heard of the name "diffuser" that might match my needs, but are there specific types I need based on phototransistor sensitivity and/or other characteristics? Like will the amount of light that shines through be based on a specific glass property or something? I'm not good with glass. How did you pick that detector? But most cheap red solid state lasers work at closer to 650 nm. What did you expect? Also, I'm really curious why you didn't use a cheap ARM processor instead of making life difficult for yourself, and also limiting the number of people that would feel like responding. Quote: Also, I'm really curious why you didn't use a cheap ARM processor instead of making life difficult for yourself, and also limiting the number of people that would feel like responding. For some reason, he is locked on an 8051. Yes, they are cheap and (last i saw) 40% of the embedded market. But his life would be much simpler with an AVR or ARM. He is not looking (I assume) at millions quantity. And the AVR/ARM have good cheap/free toolsets. I also know the AVR has internal osc at 8 MHz. I assume there are ARMs with internal osc. Yes, locked into an 8051 when there are many much better choices. ST has some low power parts in the ST32L family, but the new G0 family would work well also, and the development board is only around $15! I got mine last week. Plus ST provides a licence for the Keil ARM-MDK which is a top notch tool. Why work in the stone age when you have great tools available for free? The $15 dev board even has a built in debugger. 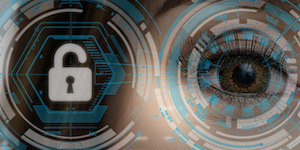 Here's more info on the G0 family, it's not too late to switch. (And no I am not affiliated with ST, I just want to mention a much better choice for the processor. If I was going to build something like this I would ditch the phototransistor as they are inherently slow due to junction capacitance. Look at using a PIN photodiode instead. Your laser should be modulated and your receiver should be configured as an AC coupled amplifier. This will remove any "DC" or low frequency sources of light like the sun or artificial lighting. I would also look at edge coupling the photodiode to the glass / plastic plate. Put a diffuse reflector like white paper behind the plate to reflect the light back into the plate. At certain angles of light entering the plate will be internally reflected and the plate will behave as a wave guide. The opposite side from the photodiode could have a reflective foil bonded to the edge to direct light to the photodiode. 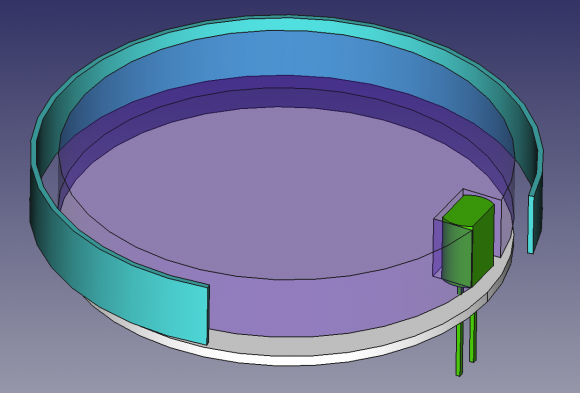 If your plate is circular, just bond a reflective foil to the edge of the plate except where the photodiode is. Consider using a clear plate and not red tinted. I would use a good quality narrow band filter (closely matched to your laser wavelength) situated in front of the photodiode. This will give you the best SNR. i would also try the 'light-guide' version. what you are asking for is some way of diffusor. there are also materials that combine both. FreeCAD source file for this is attached..
i also would just use / try a transparent Plexiglas. - some of the colors are transparent to this near Infrared - i have made some comparisons on my blog for ~825nm (hover over the picture). if you really want to go fancy you can try and test if the PLEXIGLAS LED for edge lighting does any different - its a specialized Plexiglas that is normally used to evenly light up signs or similar big sheets while coupling the light in from the edge..
but i think it could also work backwards..
have fun with the experiments! Google for specialty glass companies. Also consider pexiglass, because broken glass is Not Good Very Bad. Take your laser to a glass and a plastics stores and try it. I'm assuming the distance between where the beam hits and the location of the optosensor is pretty small - under 0.5-in? Basically, empirical is better than theory at this point. The Mark One Eyeball is a great design tool. Don't overthink this if a simple experiment will solve your problem. You can frost pexiglass by getting a sample and using 440 sandpaper. Lightly sand one side. Then shine the lazer on one side && look at the spread pattern. Flip over and repeat. Try different thicknesses and grits && how you rough up the surface. Distance of lazer to the surface? (In theory, should not matter, but verify.) Make this into a little science fair experiment. light pipe (aka light tube) ? I don't know how to reply to everyone at once but I'll put it down here. I tried plexiglass from a local arts and crafts store and that did not work. Yes, I read numerous stories about how phototransistors are slower than photodiodes because of their capacitance, but at the same time, its like a photodiode with an amplifier built-in. Good news for me is I managed to tinker with my micro the phototransistor is attached to and managed to increase the sensitivity by about 1 inch along with getting a reasonable data speed. I may need another 1/2 cm to go then I'm golden, but now that some people have presented me with glass options, I'll look into those. I thought at first scratched glass is cool and would work for much of my project, but maybe there's a specific name to some kind of uniform scratching to even out the light beam across the entire glass? I posted this kind of question on another forum and someone claimed that using light diffusers wouldn't work. I'm considering hiring a local plastics shop to do the plastic assembly for me but I haven't really seen anything they advertise specifically for light scattering. Maybe they have the name that I'm looking for that I just don't know about. I tried a few of their material samples and none of those scattered light. Probably because at the time I asked for basic plexiglass.